Dolphus Robert Stephens, son of Warren Stephens and Myrtle Beasley, husband of Alice E. Barger. Alice E. Barger, daughter of William Barger and Doxie Howell, wife of Dolphus Robert Stephens. Dolphus Robert Stephens, 81, of Magnolia Drive, Cartersville, died Wednesday, June 6, 2001. 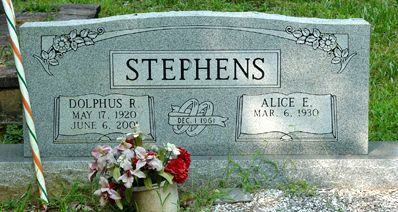 Mr. Stephens was born May 17, 1920, in Cobb County, a song of the late Warren and Myrtle Beasley Stephens, retired from Big Apple Grocery, and was of the Baptist faith. He was preceded in death by his parents, a brother, Charlie Stephens, a sister Rose Lee Fincher and a grandchild. Surviving are his wife, Alice E. Barger Stephens of Cartersville, a son and daughter-in-law, Robert and Janice Stephens of Locust Grove, a son _______ Stephens of Cartersville, a daughter, Shirley Ann Smith of Cartersville, six grandchildren, one great grandchild, a sister, Pauline Eastman of Kerrville, Texas and five nephews. Burial will be in the Old Macedonia Cemetery. Alice E. (Billie) Stephens, 78, of Cartersville, died Saturday, April 12, 2008. Mrs. Stephens was born March 6, 1930, in Bartow County, the daughter of William and Doxie Howell Barger, was retired from Cartersville Undergarment and was of the Baptist faith. She was preceded in death by her parents and her husband, Dolphus Robert Stephens. Surviving are two sisters, Rebecca Poole of Acworth and Christine Lee of White; nieces and nephews; step-children, Robert and Janice Stephens, Jerrell Stephens and Shirley Ann Smith; six step-grandchildren and one step-great-grandchild. Funeral services will be held Tuesday, April 15, at 1 p.m. in the chapel of Owen Funeral Home with the Rev. David Abernathy officiating. Burial will follow in Old Macedonia Cemetery near Highway 20. The family will receive friends at the funeral home Monday evening from 5 to 7 p.m.
Pallbearers will be James and Tyler Cox, Donald Gravley, Paul and Billy Poole, and Jimmy Mitchell.